We've been to Alton Towers a couple of times without the children. It's a long way from our home, but it's not too far from Ram's parents, and as we were staying up there for the weekend we thought that it would be nice to take the whole family this time. We had sussed it out in advance, and decided that although Alton Towers does seemed to be aimed mainly at older children, there were still a few rides and attractions that younger children would enjoy. Well, we are so glad that we did, we ended up spending nearly a whole day there and it was fantastic! So I thought I'd write a little bit about the things that we particularly enjoyed, in case anyone was wondering if it would be appropriate for babies, toddlers and young children. We used our Merlin passes to visit otherwise it can be very expensive. You can use Tesco Clubcard vouchers for entry, and there are usually lots of 2 for 1 vouchers about. Children under the age of 4 are free, which seems generous. Parking is an additional £6 unless you have a Premium Merlin pass, so that's something to be aware of. We visited on a weekday in early September and found that the whole park was quiet, and the children's areas were almost empty. Alton Towers covers a very large area, so even if your child is normally out of a pushchair it's worth taking one as there can be a lot of walking. 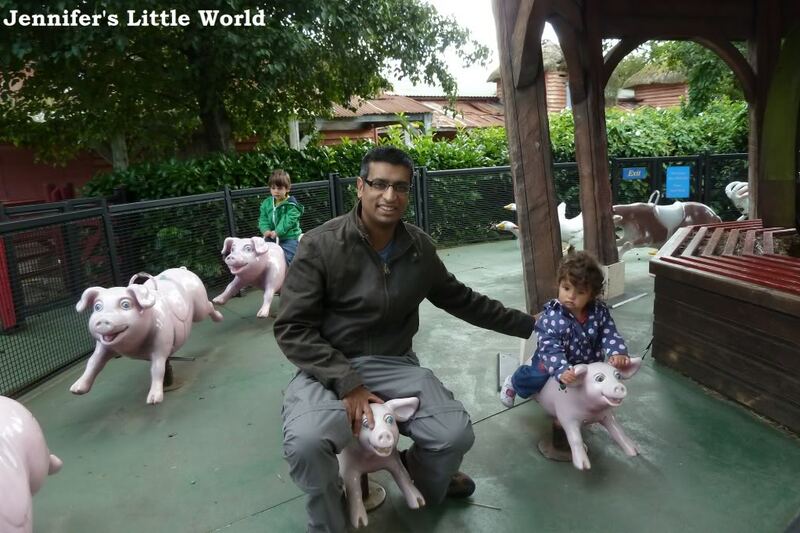 We spent most of our time in Storybook Land and Old MacDonald's Farmyard, which are next to each other and near the entrance to the park. Storybook Land only actually contains the Squirrel Nutty Ride, which is a slow moving ride in large acorns on a track up in the air, with views all over the Farmyard area. The acorns are quite small and only really hold two adults or one adult and a child. It is probably quite slow loading, but because it's not that popular I shouldn't think you'd ever have to queue for long. Old MacDonald's Farmyard has several small rides which our children loved. Old MacDonald's Tractor Ride lets you ride a full-size tractor through a little farmyard, complete with chickens. 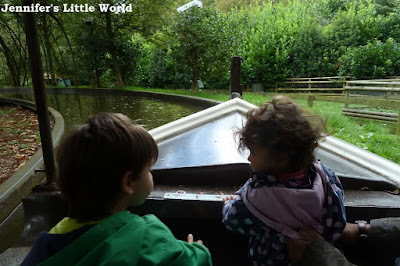 Then on Riverbank Eye-Spy you ride on a boat past lots of different models of farmyard animals. Each row of seats has a bank of buttons to press as you pass each animal (or just press randomly throughout the tour). The Doodle Doo Derby is a slow carousel type ride where you can choose which animal to ride, each equipped with an appropriate noisy button. If your child isn't old enough to sit on an animal by themselves you can stand or squat next to them and hold them in place. Old MacDonald's Singing Barn fascinated our two, it's a barn filled with noisy animal models that sing along when you press their buttons, and there are plenty of buttons to go around. There are also some real animals to see, and older toddlers can go into the Berry Bish Bash which is a large barn filled with hundreds of foam balls which you can load into air guns and fire them about all over the place. Children need to be accompanied by an adult. My son was the only one in there when we went, but I can see that it must get a bit mad when it's full, and very noisy. Finally we went in the outdoor playground There's Something in the Dung Heap which wasn't huge but again it was empty so plenty of space for our two. Then we headed over to the other side of the park. We watched the 4-D Ice Age film which they both seemed to enjoy, despite a refusal to wear the special glasses. Then we went into Charlie and the Chocolate Factory, which is a boat ride through the factory, ending with a trip in the glass elevator. Then it was time for lunch. Normally we take sandwiches but this time we treated ourselves to the Pizza Pasta Buffet Restaurant. There was a good selection of food, hot pizzas, pasta and salad, with unlimited drinks. Our children are quite fussy, but we found enough to feed them. It was quite pricy though, even with our Merlin pass discount. After lunch Mia was exhausted so she fell asleep in the pushchair while Ram took Harry on the Runaway Mine Train. He's been on the one at Chessington but I think that this one was a bit more intensive. He said he enjoyed it, although he didn't want to go on it again! Then I took him into Duel, the old haunted house ride. I was worried that he might be scared, but apart from jumping a bit when things leapt out at him it didn't seem to bother him at all! Ram took him on the Frog Hopper, which is a little row of seats that bounce up and down. He didn't see it in action before riding it which was probably a good thing, I'm not sure that we would have persuaded him otherwise! He loved it though, letting out a little high-pitched squeak every time it bounced down. Mia woke up at this point, so we took them both into the Wobble World indoor play area. It is a huge indoor inflatable area, divided into a section for taller children (over .9 m) and younger babies and toddlers. Adults can't accompany the older children, so Harry wasn't very happy about going in on his own, although he did. You can watch them through large windows in the side, but you can't see the whole area and I'd imagine that when it's busy it's very difficult to keep track of your child. The staff there were really good, and I wasn't at all worried that he would leave the area, but I was concerned that he might hurt himself or otherwise get into trouble and I wouldn't be able to see or get to him. Because he's only very slightly over the height restriction they let him come into the baby area with us and Mia, and he was much happier there. We stayed for quite a while letting them both clamber about. We used the Skyride to get back to the other side of the park, and even though we had two pushchairs we still had plenty of room. We finished the day back in Old MacDonald's Farmyard, where we rode all the rides again. At this point we were ready to go home, but there were still plenty of other attractions that we could have taken them on, not to mention a walk around the ruined Towers or the gardens. Harry even met the height restriction for Hex, but I thought that it might mess with his little mind too much. Without wanting to spoil it, it presents a very convincing illustion that I thought might freak him out! We had a brilliant day. I love that Mia is getting to the age where she can really enjoy what is going on, rather than just being the baby dragged about with us. Harry is so into everything, and it is a real pleasure to take them on an outing. 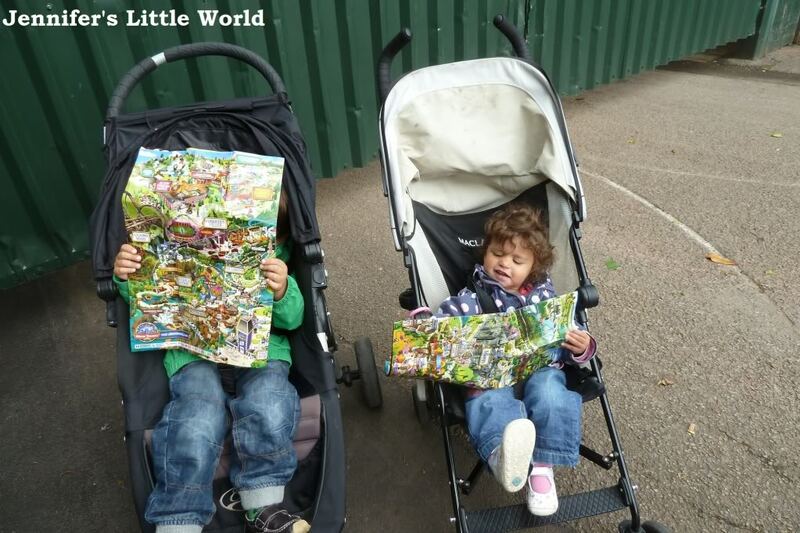 I'd definitely recommend Alton Towers for little ones! Have you visited Alton Towers with young children? What did they particularly enjoy - did we miss anything? I genuinely had no idea there was so much for little ones at Alton Towers, we've only been on grown up, rollercoaster-intensive trips! I was surprised too, I knew there were a few things but it kept us busy for a lot longer than I thought. Would really recommend!